High peaks of the Andes give way to awe-inspiring glacial lakes, acclaimed vineyards, endless vistas of Pampas grasslands, and iconic Patagonian wilderness; this is Argentina. The thunderous Perito Moreno Glacier in the south and the immense Iguazú Falls in the north continue Argentina’s extensive list of natural wonders. A place where gaucho cowboys preserve the traditions of the estancias, and Argentine barbecue asados are prepared with pride and devoured in bliss. Soccer fans shout, and the bold flavors of Argentine wine mix with the European-influenced stately buildings in the bustling streets of Buenos Aires. 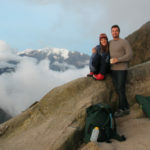 Below are some of Knowmad’s favorite travel experiences in Argentina. They seamlessly blend must-see highlights with off-the-beaten-path explorations, all the while taking into consideration the best flow and pacing necessary to truly experience each region they include. These trip ideas are intended to be used as planning tools or building blocks for a hand-crafted, custom itinerary that perfectly fits your travel style and interests. 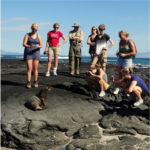 Call your Knowmad Trip Specialist at 612-315-2894or email travel@knowmadadventures.com to get started. 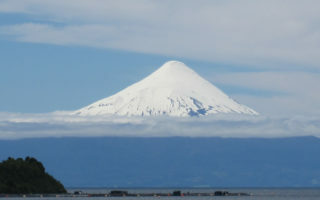 Argentina is an enormous country filled with a variety of landscapes and cultural intrigues. 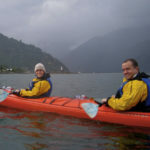 These trips exemplify how contrasting destinations like Buenos Aires, Salta and the Northwest, Iguazú Falls bordering Brazil, Colonia in Uruguay, and even Chile can be combined for an eclectic travel experience. BUENOS AIRES Argentina’s capital city, where treasured history and new styles intersect and thrive. IGUAZÚ The Iguazú Falls are a natural masterpiece, nestled in the brilliant rainforest. SALTA + THE NORTHWEST Striped mountainsides contrast with whitewashed adobe colonial villages, while lush valleys sit against dry cacti forests in the stunning scenery of the Argentine northwest. COLONIA, URUGUAY Colonia charms travellers with its beautiful, historic quarter and riverside peacefulness. Feel the essence of Argentina as you take in the magnificent sights the country has to offer. Delve into the culture of dazzling Buenos Aires, explore the beauty of nearly-untouched Patagonia, and marvel at majestic Iguazú Falls. On your trip to Iguazú, visit both sides of the falls for a 360-degree experience. Start at the Argentine side for a boat ride into the mist right beneath the falls. Then hop over to the Brazilian side for a wide panorama as cascade after cascade is slowly revealed. Argentine Patagonia boasts untamed beauty of rugged lakes, forested peaks, and endless skies. The picturesque landscapes of streams and pristine lagoons, as well as giant ice formations, are preserved within impressive national parks. Wild and windblown, often the solitude is only punctured by a guanaco grazing or a condor circling above. Follow in the footsteps of centuries of hunters and gatherers, gauchos of the great estancias, and explorers as you satisfy the yearning for the impressive spaces of this remote part of the world. BARILOCHE + THE LAKES DISTRICT Bariloche’s stunning mountains and lakes make it a picturesque destination for outdoor enthusiasts. 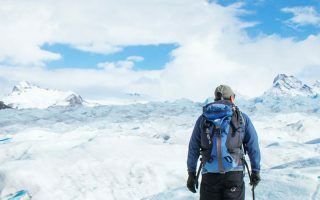 EL CHALTÉN A hiker’s paradise, El Chaltén’s trails and mountains reward adventurers with unparalleled vistas. EL CALAFATE Wonder at the awe-inspiring blues of El Calafate’s Perito Moreno glacier. USHUAIA + TIERRA DEL FUEGO Look out over the Beagle Channel at “the end of the earth” and get up-close and personal with Magellanic penguins, or make the passage to Antarctica. 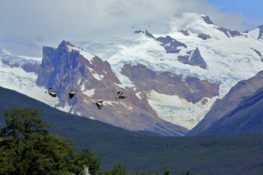 Go deep into Patagonia, venturing out for full-day hikes from charming El Chaltén, discovering Tierra del Fuego’s wildlife and trails, and getting off the beaten path in the best of Argentine Patagonia. 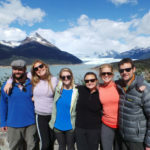 If you have fewer than five days to visit Patagonia, the Lakes District / Northern Patagonia is a great alternative to Southern Patagonia as it requires much less travel time and offers stunning beauty, excellent multi-sport activities and one-of-a-kind accommodations. Argentina has so much to offer for the foodies and wine lovers out there. Travelers often opt to start their culinary adventure in Buenos Aires where gourmet restaurants mix with historic cafés and fashionable nightclubs. Don’t miss the unique and intimate puerta cerrada (closed door) eateries, where chefs prepare special menus for small groups of reservation-only guests. Nestled at the foot of the Andes mountains, oases of luscious vineyards and respites of country homes pepper this beautiful region, and flavorful and vibrant wines pair with a decadent gastro scene in the relaxing atmosphere of Argentina’s wine country. MENDOZA CITY Central plazas and tree-lined avenues overflow with vibrant life, especially in the evening. The relaxing pace of Mendoza invites you to sit down for a glass of wine. Or two. LUJÁN DE CUYO & VALLE DE UCO Two premier vineyard valleys, each winery boasts its own personality and delightful tastings of their highly-celebrated Argentine varietal wines. QUEBRADA DEL CONDOR Take in the landscape and unique geological formations of the Quebrada del Condor gorge, perhaps spotting the local fauna. Enjoy an authentic asado barbecue in this stunning region. Don’t miss the unique and intimate puertas cerradas (closed door restaurants), where chefs prepare special menus for a small group of reservation-only guests. The seasons in Argentina are opposite of those in the Northern Hemisphere. 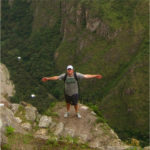 Buenos Aires and Iguazú are enjoyable year round. The summer season (November – March) is generally warmer with temperatures in the 80s °F (30 °C). An excellent time to visit these spots is often during the shoulder seasons (October – November or April – May) when you can enjoy milder temperatures and often less visitors. If you are interested in wine touring, Mendoza is the wine capital of Argentina, and pleasant year-round. During the summer months (November – March) the highs are generally in the 80s °F (30 °C). During the winter (April – October) the temperatures are a bit cooler, with average daytime temperatures in the 60s °F. The best time to visit Patagonia is during the summer months (November – March). The weather will be the warmest from December to February. The shoulder seasons (October – November or April – May) will be cooler but also less windy. This is a great time to go if you plan to spend time in Iguazú or Buenos Aires as well. During the winter months Northern Patagonia is quite rainy and Southern Patagonia is cold and could have snow, although during these times there are very few visitors and deals are available, so if you don’t mind the cold it’s a great time to visit.